My brother and his wife had their first baby last week. A little girl. They named her Brinley. We visited them this week, and she is adorable! She looks just like her mommy, and is smaller than any of my 8 babies were. I loved holding her, even though it made me feel like my baby is huge. 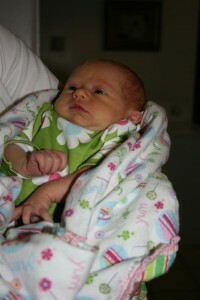 We took Brinley her baby gift, a rag quilt that I designed and named “Brinley’s Blossoms” in honor of my niece. 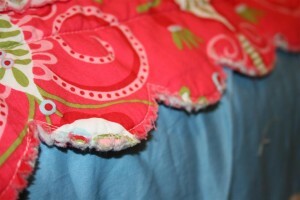 I used the same fabrics in this quilt that I used in the one I made for my baby a few months ago. I really loved this line! 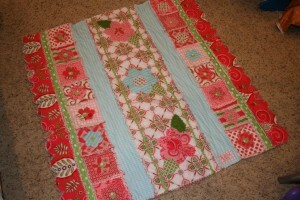 It’s a simple strip quilt with some flowers appliqued on top and in a couple of block strips. There’s no plain side with quilts like these! 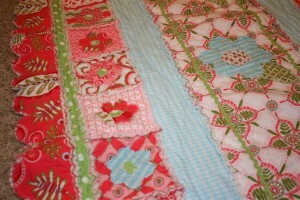 A scalloped border! 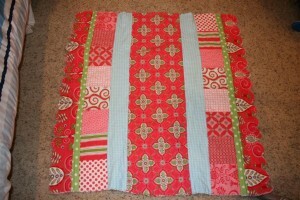 I love the way it turned out, and I think that I’m going to try another quilt using this idea. I’ve got something in mind…. are you for real? That is amazing. Can you teach me how you did that? I think I will go hide in a corner now. That quilt is beautiful! You are very talented! And the baby? Swoon! What a doll! Wow, Melissa! I’m so honored that you would visit my blog! I love reading yours. Thanks so much for your kind words. Kris, never fear! I won’t let you not finish it… it’s too cute! And I need pictures! Hi there! I am new here and your blog is simply lovely. I LOVE the name of it! You asked me about the cake stencil. Unfortunately I got it in a scrapbook Fall kit several years ago. But I think you can find something similar at craft stores. And what a BEAUTIFUL baby! That name is so pretty. Your blanket colors are super fun and it turned out perfect. Jen – So I didn’t know you had this blog until I wandered on Kristen and Jake’s and saw her jewelery board and the link here. I can’t stop scanning the ideas and the other blogs you have linked to. I think there is some Sheffield fix-it-up in me. I really like projects and trying to make stuff better around the house. Maybe I will have to get some ideas from you next time I’m there. I am just amazed at the blog – for real. Amazing. The blanket is awesome. Thank you so much for it. It was such a nice thing for you to do for our baby girl. We love her and decided today that she will need to be roommates with Sonora in about 18 years. Sound good to you?